I have some wonderful news to share, but first . . . I am looking forward to seeing many of you at the Parish Retreat this weekend. If you won’t be with us, remember that there will be no Christ Church worship services held in Austin this weekend, but you can come join us at the retreat at 9am Sunday for worship, ministry time, baptism, and Holy Eucharist! And now the good news! 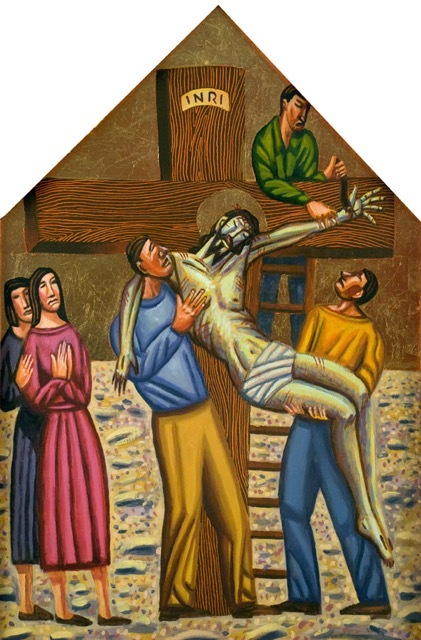 You might remember that during Lent last year, local artist Jim Janknegt offered to let Christ Church house his Stations of the Cross paintings. As we worshipped in that Medina St. space during Holy Week and since, many of you have had the opportunity to spend some time in prayer as you contemplate these pieces. They are beautiful meditations on the self-emptying sacrifice of our Lord, his humility, and His invitation to join Him in the fellowship of His suffering. These pieces have been purchased and generously donated to Christ Church by a parishioner who loves art, our parish, and most of all, our Lord. Please join me in thanking God for the generosity of His saints, the gifts of artists like Jim Janknegt who give us fresh visions of our God-enchanted world, and the opportunity to see the realization of our four Medina St. design values: welcome, blessing, beauty, and utility.